The Region ran a taster training session on 30 April. 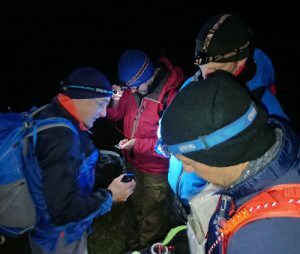 Eight leaders from across the Region spent an evening with Mountaineering Instructors Davy Virdee and Martin Holland looking at the skills needed to move towards gaining a hillwalking permit. 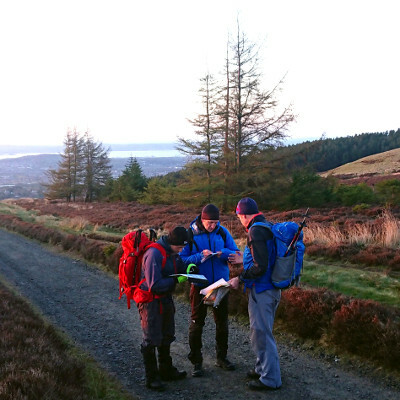 Duke of Edinburgh expeditions are common amongst many Explorer Units. For remotely supervised expeditions in Terrain 1 and Terrain 2 a supervisory permit is required in addition to your leadership permit. To get a supervisory permit, you should have a good leadership experience in your chosen terrain and be able to draw up comprehensive supervision plans for the groups you are intending to remotely supervise. Most, if not all Silver and Gold expeditions will fall into Terrain 1 and Terrain 2. Bronze expeditions, typically take place in Terrain Zero, and so no leadership nor supervisory hillwalking permits are needed. However, District Commissioner Authorisation is required. As part of this notification should be to produce a comprehensive supervision plan for your expedition. If in doubt, you can pass along expedition plans to Davy Virdee for advice. The Pentland and Lammermuir Hills are on doorstep of the Region – and with good planning, much of it falls into Terrain Zero (https://members.scouts.org.uk/por9.28) and as such you do not need a permit to explore them. These include asking for authorisation and providing route plans and risk assessments. The Regional assessor is happy to consider restricted permits to leaders wanting to take groups to the tops of hills like Lammer Law and Carnethy Hill. Please contact Davy for more details. Davy Virdee is also Regional assessor for all climbing and other mountaineering based activities.